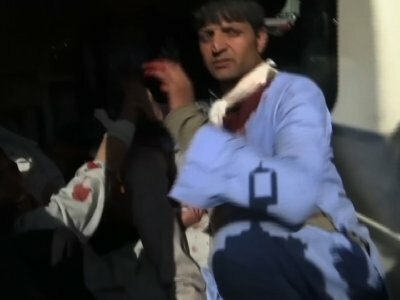 KABUL, Afghanistan (AP) — Afghan authorities have raised the death toll from Saturday’s suicide bombing in Kabul to 103, as hundreds of people gathered for funerals or awaited word of loved ones outside hospitals and morgues. Saturday’s bombing took place in the heavily-guarded city center, near a number of foreign embassies and the office of the High Peace Council, which is charged with promoting peace efforts with the Taliban and other groups. The Interior Ministry, which is in charge of the police, also has offices in the area. Officials at the Public Health Ministry said the forensic medicine department is still trying to identify a number of bodies before releasing them to families. Masoom Stanekzai, the head of Afghanistan’s intelligence service, said five suspects have been arrested for their involvement in the attack on the Intercontinental Hotel and that another had fled the country. He said four people have been arrested in connection with Saturday’s attack.